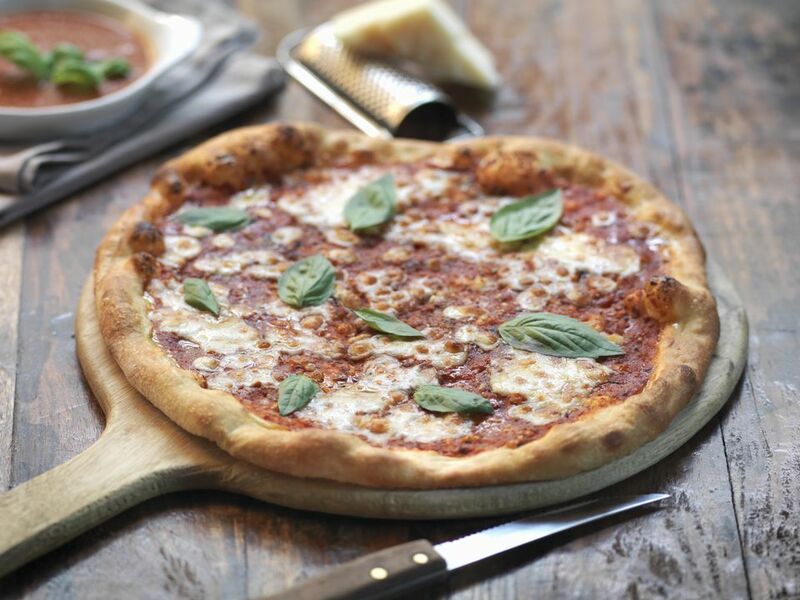 When making homemade pizza, you have the liberty to choose any toppings you want, from the type of sauce, to vegetables and meat, to the cheese—including whether you use shredded cheese or fresh mozzarella. The fresh cheese will make for a more appealing-looking pizza, and impart a pleasant chewiness to the bite. Because fresh mozzarella holds so much moisture, however, it can make pizza watery, thus ruining a delicious meal. Fortunately, there are some easy steps you can take to avoid soggy, watery pizza when melting fresh mozzarella. But first, learning the difference between fresh and shredded mozzarella may help you decide when to use which cheese. Traditionally, mozzarella cheese was made only from water buffalo milk in the Italian region of Campania. Over the years, however, it has extended its reach across the globe and come to include cow's milk and/or goat's milk and has expanded from being made by hand and sold fresh to factory-produced with a long shelf life. Fresh mozzarella is cheese made from whole milk that is produced through a simple process and sold fresh. Because of this, fresh mozzarella will only last about a week in the refrigerator. It is soft and creamy with a milky flavor, and contains a decent amount of water, which makes it low in fat; it is formed into a ball shape and often packaged along with some liquid. Processed mozzarella has had most of the liquid removed—which is why it is called "low-moisture" cheese—and can be made from whole milk, part-skim milk, or skim milk. It is sold in shredded form, as well as in slices, sticks, and sometimes balls. To extend the cheese's shelf life, potato and/or corn starch and natamycin (a mold inhibitor) are added. The packaged shredded cheese is somewhat bland in flavor, and depending on the milk fat, may not melt that well (fat helps the cheese become gooey). If you choose to shred your own mozzarella from a brick of cheese, it obviously will not have the additives or the excess moisture. But it will still melt differently than fresh mozzarella. Since fresh mozzarella retains at least 52 percent water, it will benefit from a bit of drying time. Instead of slicing the mozzarella and immediately placing on the pizza, set the slices on a paper or dish towel to absorb excess moisture; let them rest for at least 15 minutes. You can also dab the top of the slices to soak up any extra moisture. Once the mozzarella slices seem dry, it is time to add to the pizza and bake. It is also a good idea to slice the cheese thinly—the thicker the pieces the more water there is. Just be sure to watch the oven carefully as thinner slices will cook more quickly. Fresh mozzarella only takes a few minutes to melt, and once it melts if it continues to sit on the pizza as it bakes, the cheese will start releasing moisture. A solution to this problem is to bake the dough, sauce, and toppings first, and put the fresh mozzarella on the pizza during the last few minutes of cooking time. If you are not averse to processed low-moisture cheese, combining a bit of fresh and pre-packaged shredded will help cut down on the moisture. The appearance of your pie may not be as appealing, but your pizza crust will also not risk becoming soggy.